As a commercial photographer being asked by a major tyre brand to photograph one of their most important corporate marketing events in the UK can be pretty daunting, but when GT Radial told me that their event was taking place within the Arctic Circle (where the weather was likely to be -20 centigrade) and over a very full week, frankly I started to feel a little nervous. The corporate event photographs were to capture the winter tyres performing in some of the harshest of winter conditions. The setting for this event was the highly secure Test World in Ivalo, Finland. This is located some 2000km from the North Pole. 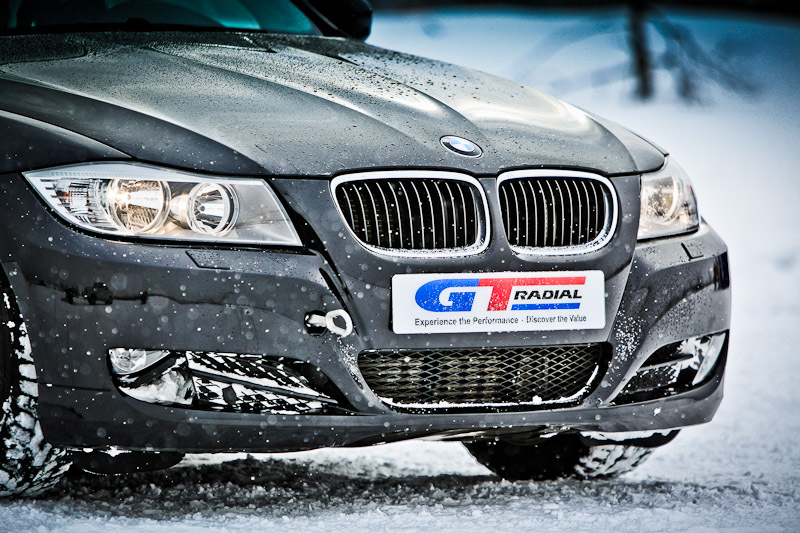 Test World is well known in the automotive industry as one of the premier facilities for winter testing and boasts 26 specialist winter (ice/snow) terrains and tracks, each designed to test the limits of the cars/tyres performance in some pretty extreme conditions. Major tyre & car manufacturers use this facility as a proving ground in which to collect sensitive data on prototype vehicles and tyres. Due to the confidential nature of their business and their reputation with major automotive brands, the centre is extremely restrictive on who has access to this facility and understandably cautious about letting an (unknown to them) UK commercial photographer into their classified areas. Understandably there was an initial rejection from the centre and the project seemed lost, but clearance was eventually received after GT obtained exclusivity of Test World for the week. Superb! I’m in, so now what…start to panic… No. Start to plan. Whenever you take on anyone’s photographic work, the concerns are always fairly similar; what time, where, how much kit will I need, when do they need the images by etc. However those concerns are doubled when photographing abroad (as there’s no quick popping back to base to fetch the missing item) and then tripled when coupled with a remote location and extreme weather conditions. I had to pack enough camera kit to allow for redundancy should the worst happen, (this is likely in very cold conditions) and then consider how to store and back up the files generated on the shoot. In a previous post I put together a little movie to go cover some of the camera equipment packed, I tried to keep it as light and portable as possible. I wasn’t sure of the conditions I was going to face when I finally arrived there so flexibility and redundancy were given a high priority. Failure was not an option. Getting my kit there and back again in one piece was paramount, so I took the ThinkTank International v2. This case offers great storage capacity, plenty of packing alternatives and it’s an all round high quality supportive case that conforms to all the current flight restrictions. Gone are the days of throwing a few rolls of film into the case, so a mixture of large capacity CF cards, computer laptop and various backup drives where included to ensure the safe return of the files and to be able to show the client the previous days work. In addition to the Think Tank case I took my trusty Crumpler Shinkler a packback with lots of room and decided that once there I’d decant the items I needed into the Crumpler on a day-to-day basis. 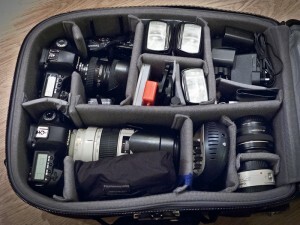 This video shows the kit on the shoot within the Crumpler back pack. On the next blog post I’ll take you through the location and the snowy environment and show you some tips to keeping batteries alive in sub-zero conditions. In the meantime click on the main picture above to see some of the images from the shoot.